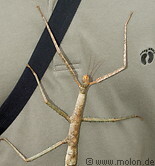 Photos of large and unusual insects, who live in the jungles of Malaysia. These include moths, butterflies, the Chalcosoma Caucasus giant beetle with the long horns, another giant beetle, giant millipedes, leaf insects, stick insects and a giant grasshopper. The leaf insect, stick insect, giant grasshopper and the leaf frog all have a special appeareance which allows them to easily hide in their environment and escape predators.